The University of Southern California claimed the top spot in this week’s USRowing/Collegiate Rowing Coaches Association NCAA Division I Varsity Eight Coaches Poll, while Western Washington University and Williams College topped the Division II and Division III polls, respectively. In Division I, USC moved into the top position in the poll, earning 19 of 24 first-place votes. 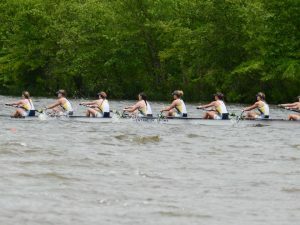 Brown University, last week’s top-ranked boat, received the remaining five first-place votes to rank second. Ohio State remained in third position, followed by Yale University and the University of Virginia. Western Washington was once again a unanimous choice for the top spot in the Division II poll, earning all five first-place votes. Dowling College ranked second, while the University of California at San Diego ranked third. Williams College received all seven first-place votes to remain on top of the Division III poll. Trinity College ranked second, followed by William Smith College, the United States Coast Guard Academy and Colby College. Not Ranked But Receiving Votes: Washington State University 39, Northeastern University 7, Gonzaga University 3, Clemson University 2, and University of Wisconsin 1. Not Ranked But Receiving Votes: North Park University 15, University of Mary Washington 13, Vassar College 11, Rochester Institute of Technology 9, Simmons College 8, Lewis & Clark College 7, Skidmore College 7, and Connecticut College 6.